Summer is beginning to give way to autumn and as much as we love summer, autumn is a perfect time for getting out with the camera. With vibrant colours, misty mornings and dazzling sunsets to capture there are so many opportunities. So with all these amazing photographic conditions around us, how do you make sure you take stunning images? The way the sunlight catches this stunning autumnal tree really caught my eye on our walk through Central Park, New York a few year ago. Sometimes it pays to look up! When does autumn actually start? There are several different ways of defining from the autumn equinox (when we have roughly the same hours of daylight as night) on the 23rd September to simply splitting the year into four equal parts, in which case autumn starts on the 1st September. For us though, the really important date is when the trees start to change and we see those stunning colours and early morning mists. This is a little harder to predict as it relies heavily on the Great British weather! With the extremely hot summer we've just endured and/or loved, it's possible the trees will start to shed their leaves slightly earlier as the lack of water throughout the summer can weaken them. The awesome autumn displays normally peak during the last couple of weeks of October so it's possible they may be slightly sooner because of this summer's heatwave. 1) What time of day to go? More often than not, stunning photography relies on good light. Generally, the light is at its dazzling best during what we call golden hour. 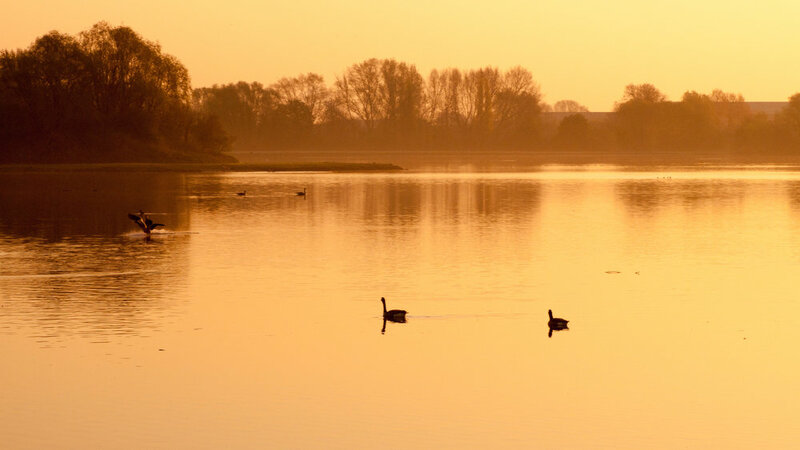 This is the time shortly after sunrise or before the sunset when the light is softer and has a golden colour to it (hence the name - golden hour), however from now until spring the sun doesn’t get as high in the sky so great photographic conditions exist throughout the day. That being said, cooler nights brings a much higher chance of early morning fog forming in low lying areas. Rays of early morning sunlight coming streaming through this fog, or half covered trees or mountains sunken into this fog can allow for some truly exquisite landscape photography. During the peak of autumn, trees seem to change colour day by day and even hour by hour depending on whether the sun is hitting them. The leaf colours are one of our favourite things about autumn so getting out in the woodlands, forests or even your local park can be the perfect place for an autumnal landscape. Composing your images with leading lines that draw your eye through the scene; for example a winding path or track surrounded by autumn foliage or an avenue of trees. Another favourite technique of mine whilst on a country walk is to include a path or a signpost. This helps to tell a story; where does the sign or path lead to? As the brackern starts to die and hillsides are transformed into a golden blanket of colours, hills and mountains become the perfect location to get a birds eye view for a stunning landscape. They can also make stunning locations for a golden sunrise or sunset, if you are prepared to hike up there or back in the darkness! Early morning reflections are silhouettes can make for stunning images. Lake and rivers are always one of my favourite places to photograph. You've got the abundance of wildlife, mirror like reflections and of course you can isolate parts of the scene such as the colourful leaves. Once again, early in the morning provides the best opportunity to photograph rivers and lakes and you're more likely to have a calm, windless morning, which can make for stunning reflections, and there is likely to be a lot more wildlife starting to explore looking for their breakfast. The bright, colourful background really makes this picture of these flowers much more eye catching. Get down low. By getting down low and looking up, you can really explore the depth of the colours, especially when compared to a bright blue sky. Look down. Whilst the colours of the leaves in the trees can be stunning, the forest floor will also be a delicate patchwork of yellows, reds and browns. These are best photographed when the sky is overcast and the floor is damp as this really helps enhance those colours. Get close. If you have a telephoto lens, you can zoom in close (otherwise zoom with your feet - or your knees - and get closer). When getting in close, think about the background, an open background colourful background can really emphasis an object in the foreground. Take a friend. As fun as exploring nature is by yourself, it's even better with a friend, or one of your little explorers! They might also make for a great model to look longingly into the distance or for throwing around autumn leaves (always a favourite of ours!). So as summer gives way to autumn, don't despair. In some ways I think it's the most beautiful time of year, especially for photography and I can't wait to get out and photograph some family portraits! If you’re looking to update your family photographs don’t hesitate to contact us below!